In the tradition of the previous seasons, Outlander continues to get better and better with each new episode. Attention to the smallest detail and Claire’s constant internal struggle between 18th century and 20th century really drives this show to new heights. Do No Harm focuses on Claire’s personal beliefs in a time that women’s voices are suppressed, slavery is the way of life and politics do not align with equality and justice for all. Jamie, Young Ian and Claire have made it to River Run with basically nothing but the clothes on their back. Auntie Jocasta (played by Maria Doyle Kennedy, who bares an uncanny resemblance to Jenny and many other MacKenzie’s we’ve met) is thrilled to greet them and invites them to stay as long as they’d like in her stunning colonial plantation home. Being from a different time, Claire is taken back by the amount of slaves kept on Jocasta’s property. You know Claire’s read about slavery in history books, but experiencing it in person is sickening to her. So when Auntie Jocasta pronounces Jamie Master of Estate and heir to River Run, without consulting Jamie first, Claire puts her foot down. She will not own any slaves! But this sentiment immediately wrecks havoc for Jamie, Aunt Jocasta and Claire as Claire tries to heal a slave, Rufus, that is bound by the law of bloodshed and due for an execution. Claire must learn that in 1767 tending to the needs of a slave, seeking justice for them or simply trying to free them, will create bigger issues not just for Jamie & herself but also for the slaves themselves. The way that Aunt Jocasta treats her slaves, with benevolence, is possibly their best option. It is increasingly apparent that Claire is making quite the impression on Young Ian. John Bell plays this role with such curiosity and a profound sense of human value. You can see a boyish sense of wonder and keen adventure in his eyes, while also portraying such strong beliefs in equality and justice — adapting quickly to each new environment. Expect to follow in love with this character as Young Ian comes into his own. Can you believe the filming location for River Run was found in Scotland?! Because that’s exactly where the Outlander crew found Aunt Jocasta’s waterfront property colonial style plantation home. Not quite on a river, but on a serpentine pond that felt close enough. The interior of the home was created entirely on the Outlander stages. Everything from the staircase to the bedrooms to the parlor. Kudos to the set design department, this home is simply gorgeous. 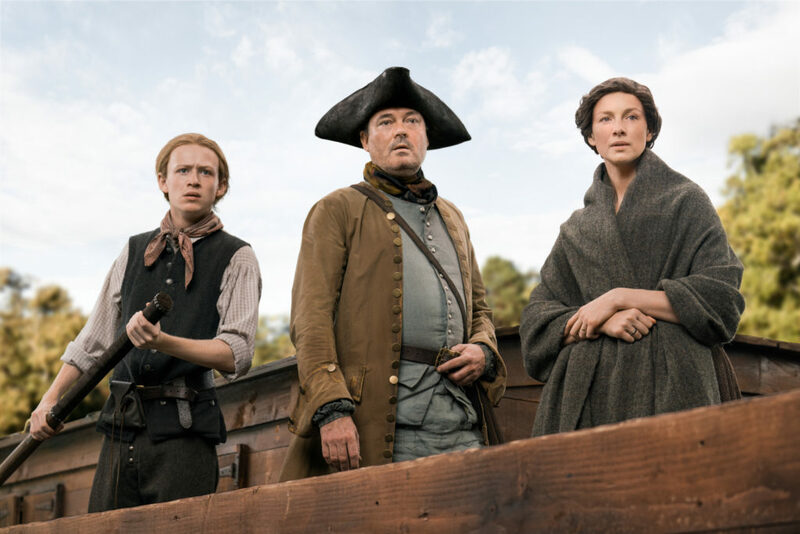 In the past three seasons we’ve gotten close to a lot of characters and it’s in episodes like Do No Harm that you start to wonder what Jenny and Ian are up to, how Brianna is doing and where her relationship stands with Roger and exactly where did Fergus and Marsali wind up after last week. It does look like next week’s episode will touch on Brianna and Roger at least! Outlander Season 4 Episode 3 airs on Sunday, Nov 18th at 8pm EST/PST.